Ruby Miller is living a pretty fantastic life. Famous parents, fancy restaurants, fabulous parties. But all of that comes with a price. And Ruby finds out the hard way. She overhears her friends gossiping about her family, her money, and how the only reason they put up with her is because she's one of the most well-connected girls in Hollywood. So Ruby decides to get unconnected. She convinces her parents to send her to a boarding school in Maine. A place where she can reinvent herself with new friends, a new story, a new life. For the first time ever, people begin noticing her for her personality and her incredible dress-designing skills. The only problem is that it takes so many lies to keep her new persona all stitched together. But Ruby's smart. All she has to do is keep her secret a secret and and all will be just fine. But just before Parents' Weekend where Ruby's dresses will be on display during her very own fashion show, one of her stories begins to unravel. Now, with everything on the line, she has to find a way to keep the truth hidden from her new friends, her new crush, and the entire school. There are a ton of reasons I love this book. I'd list them all, but I'd probably break the internet or something like that. So I'm going to list my top nine Reasons I Recommend Ruby Reinvented. And because we're celebrating this book's release tomorrow, My reasons (or the first letters of each, anyway) will spell out the final and single-most important recommendation I can offer to you. Budding romance. I'm a sucker for cute, adorable, innocent, and awkward love. Unbelievably impressive writing. From world-building to character development. Yards and yards of fashion. This book made me want to learn how to sew. Interesting characters. You won't find any cardboard cutouts here. Tickles the funny bone. There is so much wonderful humor on every page. New surroundings. Reading about the beauty of Maine was just so incredible. Oh-no moments. Ruby's not perfect. She gets herself into trouble. A lot. Well-crafted dialogue. Each character's is unique, spectacular, and totally believable.
! This story may be a contemporary, but there's still so much excitement in it! So there you go. Ruby Reinvented. This book has so much to love. And we here at Kidliterati can't recommend it enough. Ronni isn't just a fellow blogger, book reviewer, critique partner, and beta reader. She's also an incredible friend and an exceptional writer. So trust us when we say—or secretly embed into our top-nine lists—BUY IT NOW! Because we mean it with all of our kidlit-loving hearts. 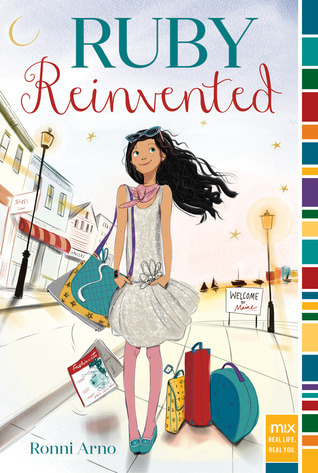 Buy your very own copy of Ruby Reinvented from IndieBound! This sounded so good that I ordered it without reading it! The order should come in very soon, and I am looking forward to it!